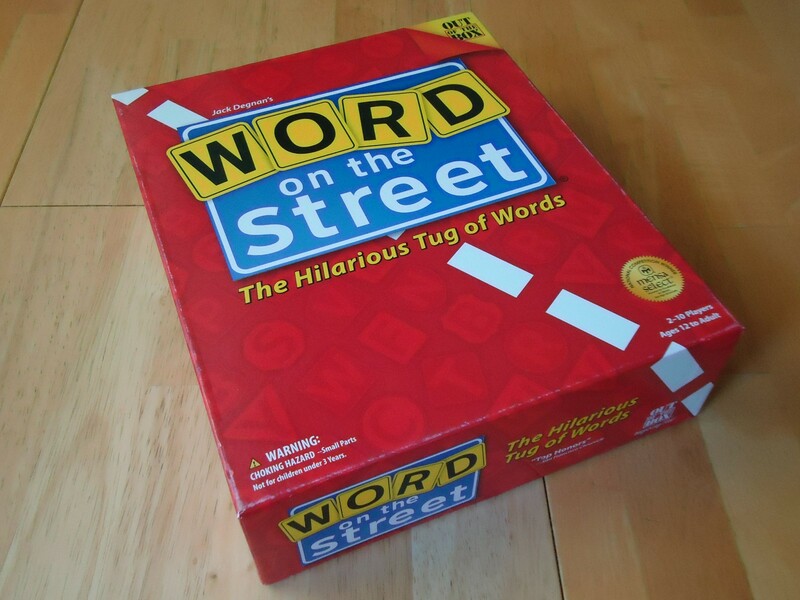 Word on the Street is a simple tug-of-war-like word game. 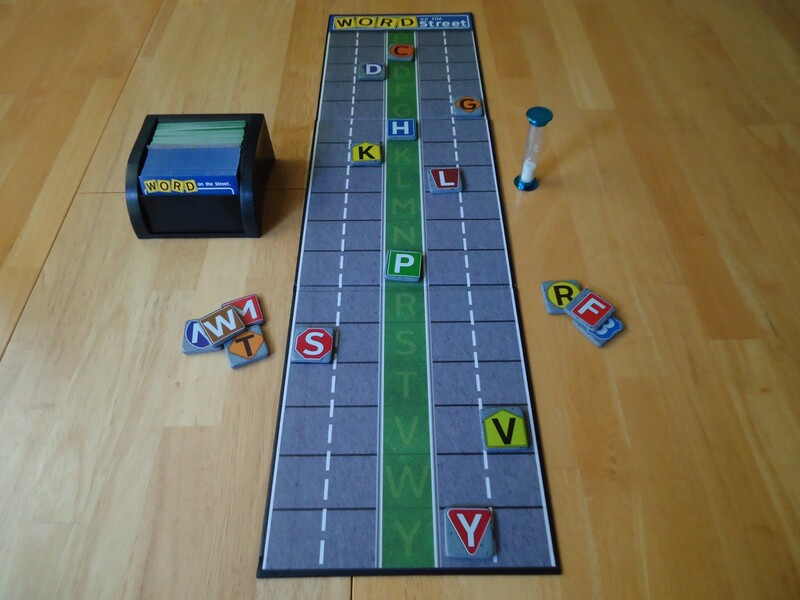 The object of the game is to the be first player/team to collect eight letter tiles by coming up with words that will bring those tiles off the board and into your possession on your side of the street. The playing area consists of a long board designed to look like a four lane road. 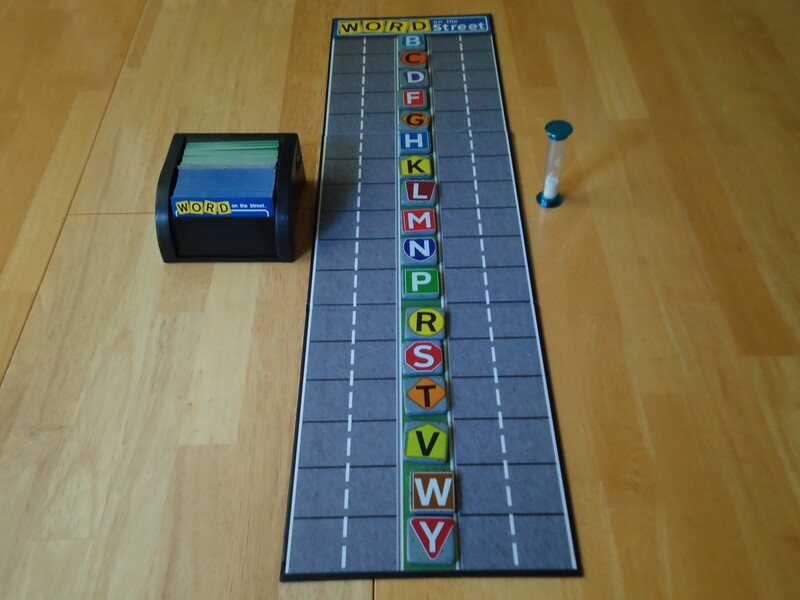 The letter tiles are placed in the “median” at the beginning of the game. (The tiles are bakelite tiles that are chunky and fun to play with.) Most of the letters of the alphabet are in the game, except for vowels and the hard to use J, Q, X, and Z. Before play begins, decide if you will use the blue or green side of the category cards and arrange them in the card tray accordingly. (The categories on the blue side are a bit more difficult than those on the green side.) Players divide up into two teams (if more than two players are playing) and play begins. On your turn, draw the first card from the category tray, read the category aloud, and place it on the table, category side up, so that all can see. At the same time, the opposing player/team flips over the sand timer to start your 30 seconds. A game all set up and ready to play! When the timer runs out, an opposing player says, “Stop” and you must stop moving letter tiles, even if more tiles could be moved. If the opposing players wish, they may challenge either your word choice (i.e. if it doesn’t match the category) or your spelling of the word. If the challengers are incorrect, the tiles are left in their new positions and the challengers may lose their next turn, depending on the type of challenge issued. If the challengers are correct, any tiles in question must be moved back to their previous positions and play passes to the challengers. Once any challenges are resolved, the category card is returned to the back of the tray and play passes to the next player/team, unless that team lost their turn due to an unsuccessful challenge, in which case the current player/team takes another turn. Play continues back and forth until one player/team has captured eight letter tiles. Word Up or Words Fail Me? Word on the Street is a very different entry in the word game genre. 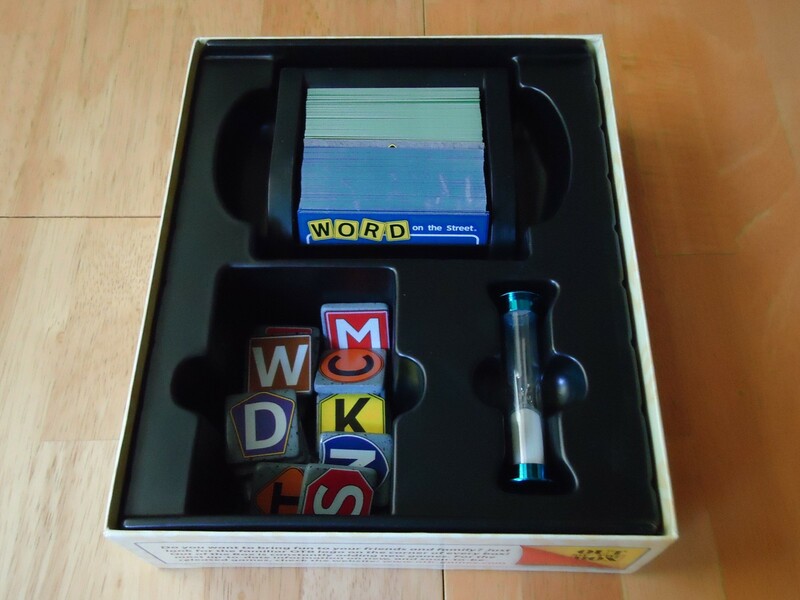 Most word games either challenge your knowledge of big/obscure words (Scrabble), or they’re a speed race to find the most words (Boggle). In either case, you’re rewarded for having the biggest, weirdest vocabulary. This is often frustrating to players who simply can’t compete on weird word knowledge alone and it’s a primary reason why word games are often the most polarizing games on the market. You either love them because you win all the time, or you hate them because you lose all the time. There’s almost no middle ground. Word on the Street is, pun intended, the best middle of the road word game I’ve ever seen. 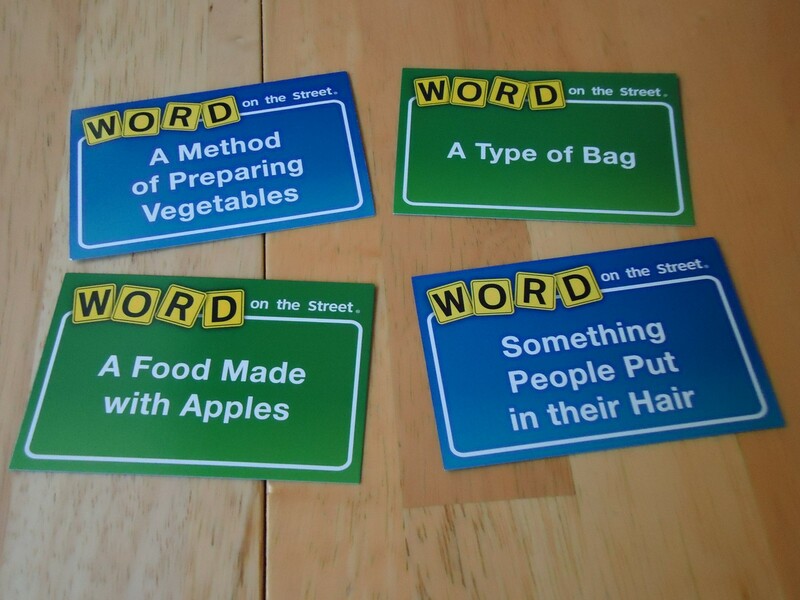 What makes Word on the Street different from other word games is that it forces you to come up with words that will move the most letters, not just words that use every letter in your possession or the letters already on the table. Even more challenging, the word you come up with has to fit the category card that you draw. So while the word, “Success” might lure that S-tile over to your side of the board, it’s not going to help you if the category is “A Color.” A winning plan must be two-pronged: Coming up with a word that matches your category and which also contains the letters you need to move tiles to your side of the board. The good news is that, unlike in many word games, proper nouns, place names, etc. are allowed as long as they fit the category and adhere to the other rules of word choice. This opens up your choices quite a bit. While a big vocabulary is helpful in Word on the Street, it’s not required to win the game. This game doesn’t simply challenge your word knowledge, it also challenges your general knowledge and your ability to think quickly. It’s helpful to know many different items that could fit many different categories because you’ll have a better chance of coming up with words that will move the most letters. Unlike in Scrabble, however, they can all be common words like Success, Pudding, or Busses and you’ll be rewarded. And that “common touch” is part of what makes this game so great. A team of engineers can play against a team of word nerds and still be competitive. Throw in the timer that makes you think quickly under pressure and you have almost a perfect hybrid of trivia, word, and party game. Some of the category cards. About that timer… Thirty seconds might seem like a lot, but when you first have to come up with a word, spell it, and then move the corresponding tiles, you realize that it’s not much time at all. I don’t know how many times I’ve come up with a great word, only to start moving tiles and have the other player say, “Stop.” That’s painful, especially when you could have won a tile if you’d been able to keep moving. You have to be accurate and quick to win this game. This isn’t Scrabble where you can spend 20 minutes laboring over the board and trying to come up with the absolute best word to play. A lot of time in Word on the Street, you’re just going to have to play something that’s good enough. Further complicating things, you need to think ahead a little bit and try to decide whether you want your next turn to help you or hinder your opponent. If you see that your opponent is getting close to capturing their seventh or eighth tile, you might not want to come up with a word that moves tiles for you. Instead, you might want to come up with a word that will back some of your opponent’s tiles up so that you can buy yourself more time in the game. But this isn’t something you want to be trying to decide once you’re on the clock. You need to think ahead and know what your goal is before that timer is flipped over. As if all of this isn’t enough, you get to try to bother your opponents and try to lure them into mistakes. It’s called “Sidetracking.” During the brainstorming phase, opposing players can suggest words for the category, even if they don’t fit or are silly and distracting. You’re trying to get the other team to settle for a less-advantageous word, or else simply distract them enough so that their time runs out before they come up with something great. A game in progress, with some tiles already won and others on their way off the street. The timer, word choice, strategic options, distractions… It’s a lot to manage; much more than is found in most party or word games. The game moves fast, though, despite all that’s going on. The timer keeps the game moving and prevents someone from bogging things down as they search for the perfect word. Most games end in 20-30 minutes, making it a good filler or get-together game. It scores high on the “let’s go again” meter, so it may end up consuming much of a night as teams try to avenge their losses. The box says that Word on the Street is for ages 12 and up and I’d say that’s fair. While younger kids might be able to play, the game does reward a broader life experience. Little kids might not know enough “Things That Come In A Can,” for example, to be competitive and they may not be able to come up with words quickly enough. However, you could put younger kids on a team with adults and older kids so that they can feel like part of the group, even if they can’t contribute as much. And they might even learn something, as this game does promote building a bigger vocabulary and can be a bit educational. There are a couple of negatives to Word on the Street, but they are mostly nitpicky. First is the relatively small number of category cards in the game. While there are many words you can use for each category, the categories are going to get repetitive if you play this often. That doesn’t mean that the game isn’t replayable. The word you need to come up with for each category will be different based on the tiles available and their placement on the street. For example, using the word “Yellow” for the category “A Color” won’t be the best choice for every game because the “L” tile may already be off the board when you draw that category. But while the game is very replayable as it is, you may just get tired of seeing the same categories over and over again. Thankfully, there is an expansion available if you want some more cards. The insert keeps everything neat; the board and rules fit on top. A related issue is the ability for experienced players to game the system a bit by memorizing the most useful words for each category. For example, a good word for the category “A Container” might be Tupperware. If you need to move the P and R tiles, this would be a good choice. An experienced player might be more readily able to come up with that word, having seen the category before and committed that option to memory. Granted, this isn’t likely to happen often or even be useful (if you pull the Container category and P and R have already been taken, the word “Tupperware” isn’t going to help you much), but it can happen and experienced players may have a bit of an edge if they’re good at remembering useful words. One other minor drawback of the game is that, like many party games, the challenge system relies on players forming a consensus about what counts and what doesn’t. A dictionary can be helpful here, but sometimes it’s going to be a judgment call, especially when the challenge concerns whether the chosen word fits the category or not. While many things will be clear, there will always be those cases where someone who wants to be a jerk can impose his or her feelings on the group and penalize other players on questionable grounds. If you play with bad sports or people who like to make other people miserable, this might be a game to avoid or else come up with some bulletproof house rules to keep it fun. Accommodates a large number of players/teams; good for get-togethers. Simple rules, quick set up, easy for non-gamers to get into. Good quality components; love those bakelite tiles! A party game for people who want to think at least a little bit. There is some strategy involved in the words you choose and whether you help yourself or hinder your opponent. Rewards more than simple word knowledge and obscure vocabularies. Promotes vocabulary building; educational value. The cards can get repetitive after a number of games. It is possible for experienced players to "game the system" by memorizing go-to words for certain categories. Challenge system relies on people playing fairly and being nice to each other. Thanks for the review. I’ve been wanting to check this one out for a while and your review just makes me more interested. Do you know anything about the different versions? A quick amazon search shows four different versions and an expansion and I’m not sure where to start. There’s the one in your screenshot and the expansion you mentioned, but there’s also a “revised” version, a “junior” version, and a “party case”. The party case has all the same components as the boxed version, except the case is a bit smaller and has a carrying handle. There are also two sand timers, which can move things along a bit faster since you don’t have to wait for the timer to run out to start a new turn (if the team was fast enough to leave time on the timer). The revised version is, I believe, just new (prettier) box art and maybe a few extra cards (not sure how many, if any, it’s just a rumor I’ve heard). I know there was an error with the first edition where some did not receive a card divider and that was corrected in the revised. Thanks for the review and addendum! I’ve been trying to figure out the difference between all the versions too. The game sounds pretty good, from your review.